After a long, dark, and cold winter, the sudden sunny spring days gave us the perfect opportunity for a weekend break in nature. Nearby Lake Tuusula, with its unique mix of cultural sites and wonderful scenery, was our chosen destination, with the added benefit of being less than an hour away from Helsinki centre. 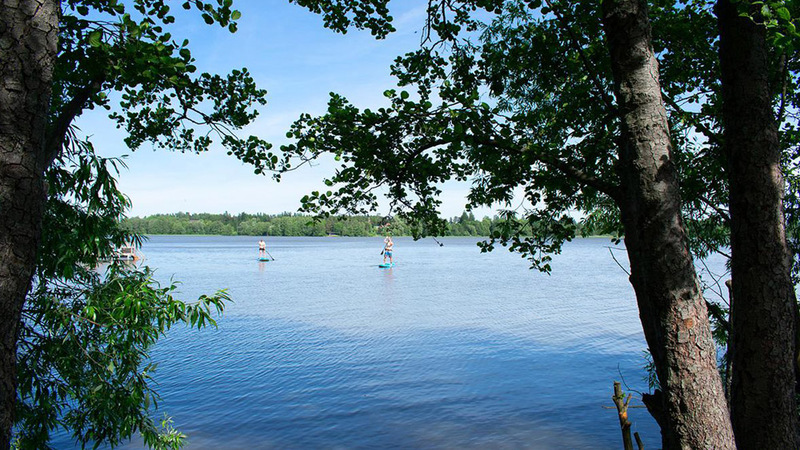 Lake Tuusula is 8 km long with an area of around 6 square km, providing visitors with an excellent opportunity to experience the nature of southern Finland. It is particularly popular with bird-watchers, with two observation towers located at opposite ends of the long lake, and has played an important part in bird research since 1940. 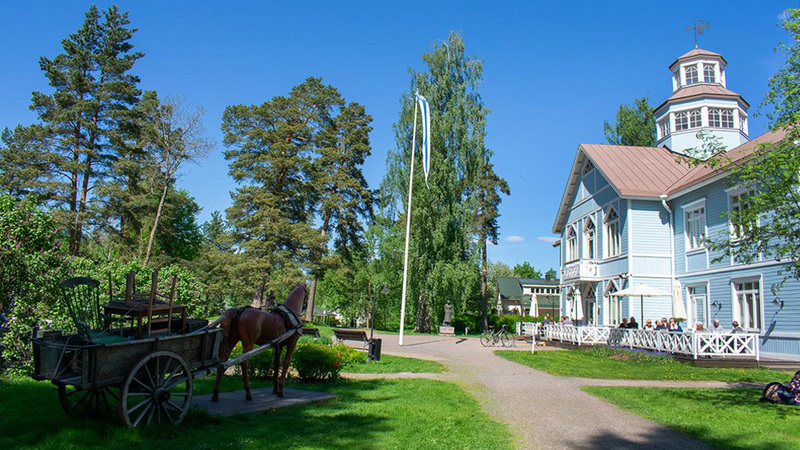 Stretching from Tuusula to Järvenpää, Lake Tuusula is famed for having once been home to one of Finland’s most prestigious group of artists, and the homes they once lived in still dot the lakeside paths, providing visitors with a chance to step back in time to the Golden Age of Finnish Art. The lake itself is circumscribed by a fine cycling and hiking path, which is ideal for exploring the abundant natural beauty of the area, while taking in the fresh air and sun. 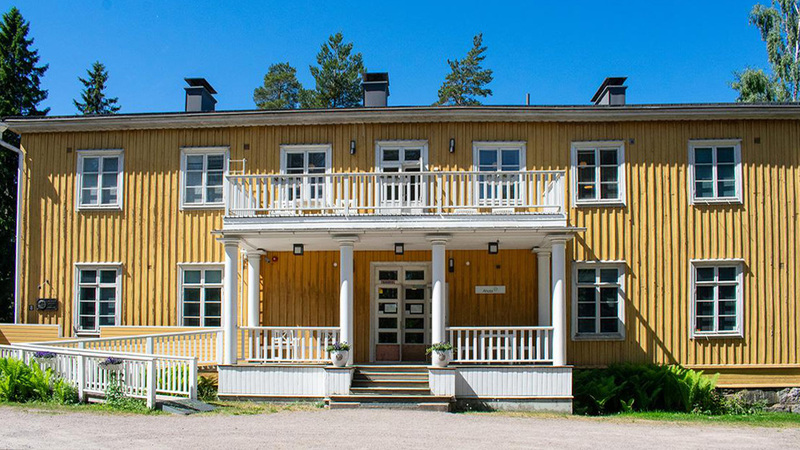 We had a number of choices of accommodation available, in the end we settled on Onnela Inn, primarily because of its lakeside location – and the saunas it offered right on the shores. We had also considered Villa Tammikko, a delightful private villa in a secluded location surrounded by forest, and the modern and luxurious Pescator Villas had also looked enticing, but decided that we’d prefer to have full service than fending for ourselves. From Helsinki central station we caught the train to Järvenpää, a 30 minute journey, and from close to that station. We found out that the Lake Tuusula HopOn HopOff bus, which drives around Lake Tuusula, stops outside Onnela. The 5 € ticket is valid for the whole day, so there is plenty of time to explore all the fine attractions on the route – there are 21 stops along the way, so visitors don’t have to miss anything, with the stops clearly marked for the convenience of tourists. Despite its close proximity to Helsinki, Lake Tuusula has tended to be better known by Finns than by tourists, so perhaps a quick introduction to this excellent destination is in order. The story begins with painter Venny Soldan-Brofeldt and her husband, writer Juhani Aho, who were the first of many to settle on the shores of Lake Tuusula, in 1897. They would later to be joined by composer Jean Sibelius, painter Eero Järnefelt, and painter Pekka Halonen with their families. 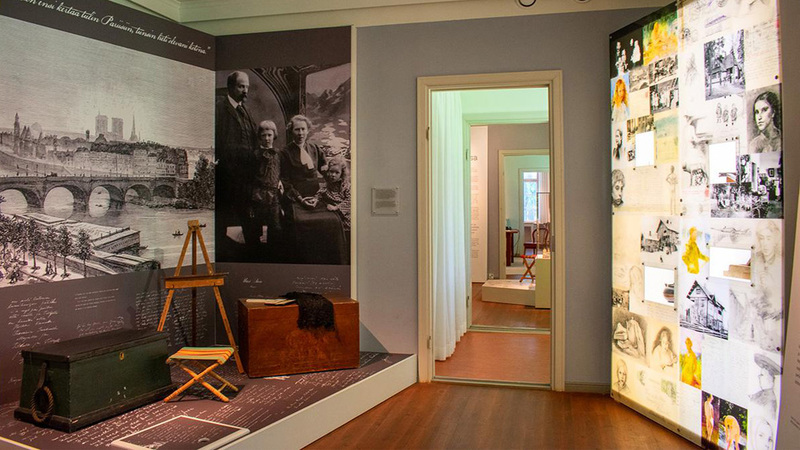 Today their villas are open to the public, as is the cottage where Finland’s national writer, Aleksis Kivi, spent the last months of his life. 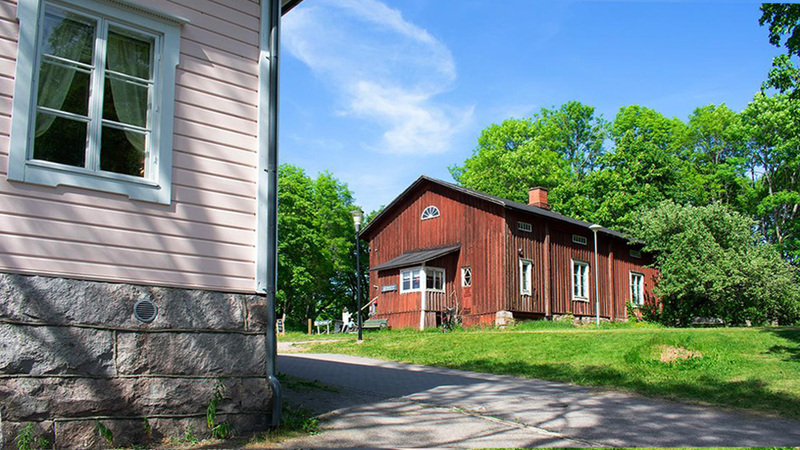 Also along the route are the Lotta Museum, artist’s home Erkkola, the Anti-Aircraft Defence Museum, the Klaavola Museum of Local History & Culture, Kasarmi Art Centre, Tuusula Church, and the Worker’s Home Museum. 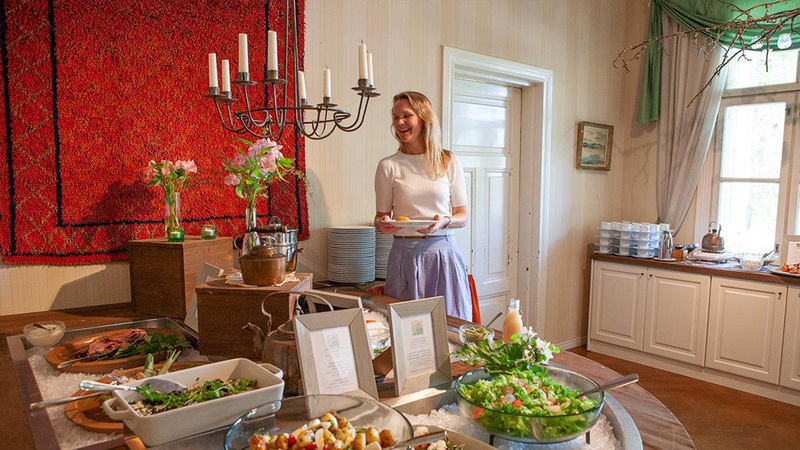 After we unpacked at Onnela we made our way by bus to the Krapi estate, and in particular to Krapihovi where we enjoyed an excellent buffet lunch, with many of the dishes provided coming straight from Krapi’s own curehouse, buttery, and bakery. Having eaten our fill we took a stroll in the grounds, admiring the gorgeous ochre wooden buildings, and the views over the nearby Tuusula Golf Club. Then it was time to fully explore the famous museum road Rantatie, a 4km lakeside road that follows the contours of Lake Tuusula passing all the villas and museums. Krapi conveniently had bicycles we could rent, and with the weather as perfect as it was we decided that two-wheels was the perfect way to explore further. 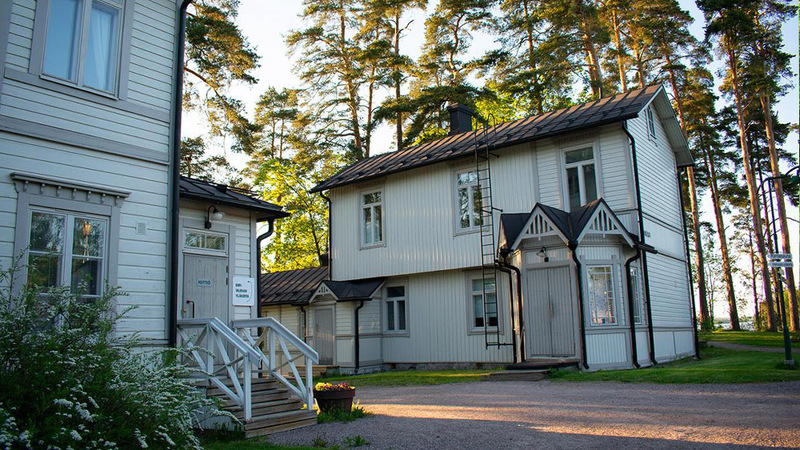 We began with the Lotta Museum, dedicated to the Finnish auxiliary paramilitary organisation for female volunteers called Lotta Svärd, known as ‘Lottas’, who played a significant role during the wars of the 20th century. Krapi’s resident local artist was on hand to share his insights into the history of the area, and the work done by the Lottas, which was fascinating to hear. 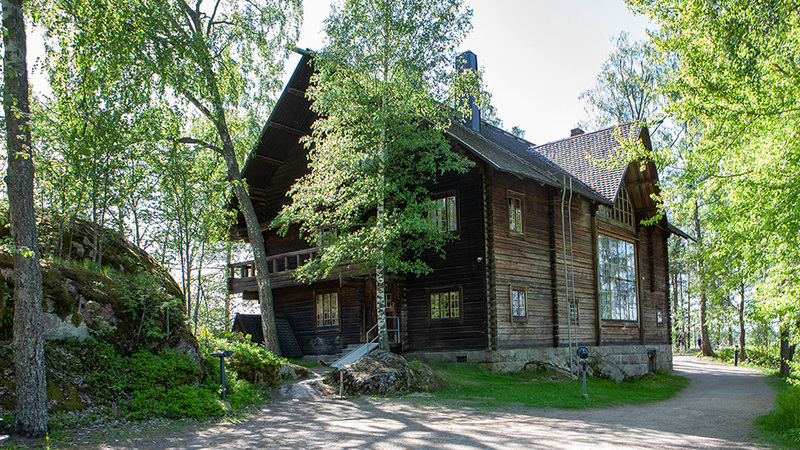 Nearby was the humble cottage where Aleksis Kivi had spent the last months of his life, and Erkkola, a charming villa built by the artist Pekka Halonen for the poet J.H. Erkko in 1902. Today this log cabin hosts numerous cultural events and small exhibitions during the year. 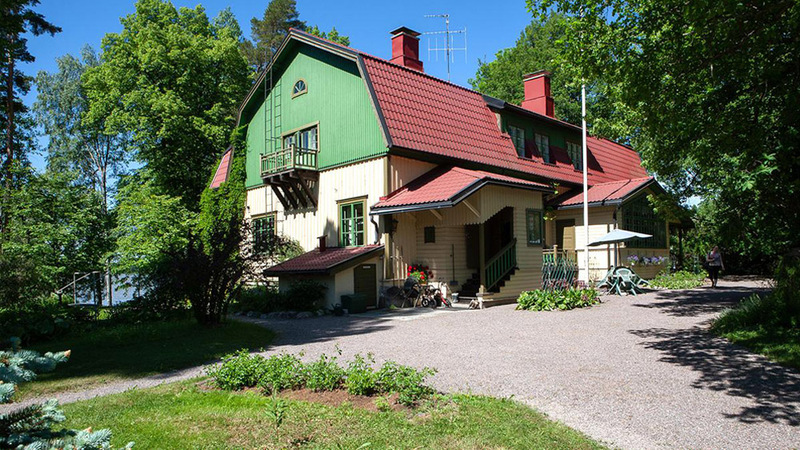 We hopped back on our bikes, alighting at Ainola, a log-built villa designed by world-famous architect Lars Sonck, which became home for Jean Sibelius and his family from 1904. The peace and tranquility the great composer enjoyed while living here became indispensable to his work, and tucked away in the garden we found his grave alongside his wife, Aino, for whom the house in named. 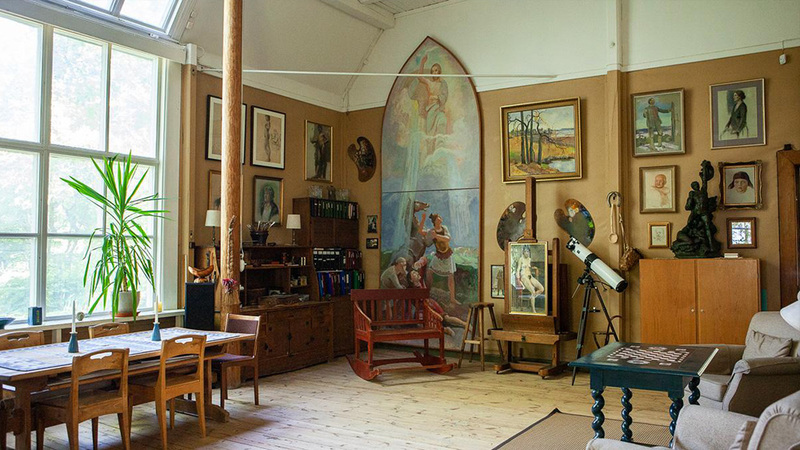 A short distance away we discovered Suviranta, the former studio residence of the painter Eero Järnefelt, a delightful wooden building that has only recently opened to the public – on Tuesdays, Thursdays, and Sundays there are guided public tours, which need to be booked in advance. 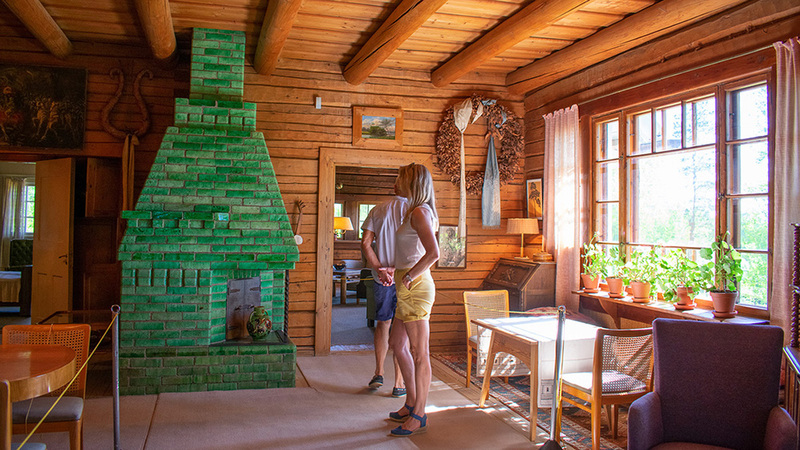 Past that we came to Ahola, which exhibits the life of painter Venny Soldan-Brofeldt and her husband, the writer Juhani Aho, who were the first artists to settle in the area. By now the evening was drawing in, so we decided to make our way back to Onnela, stopping off at Halosenniemi on the way, which is to my mind the most striking building of all those along the museum road Rantatie. 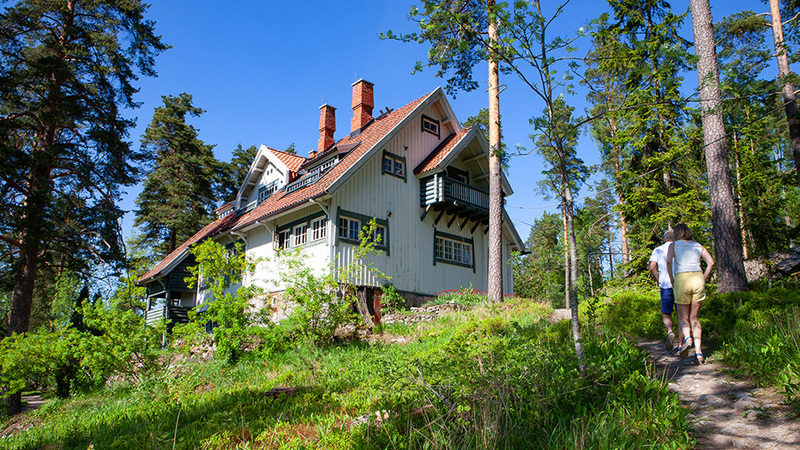 This gorgeous log house was designed in the national romantic style in 1902, and was the wilderness studio of painter Pekka Halonen. Today, it operates as an art museum, and has been renovated to its original style. The exhibitions change a number of times during the year and feature Halonen’s own work as well as that of other well-known painters. Having explored it thoroughly, we returned our bicycles to Krapi before continuing to our base in Onnela where we enjoyed a peaceful picnic by the lake admiring the sunset, before retiring for the night. The following morning arrived in glorious sunshine again, and we were informed by our hostess that on the other side of the lake there were more attractions to be enjoyed, including a beauty spot with some of the finest views in southern Finland. 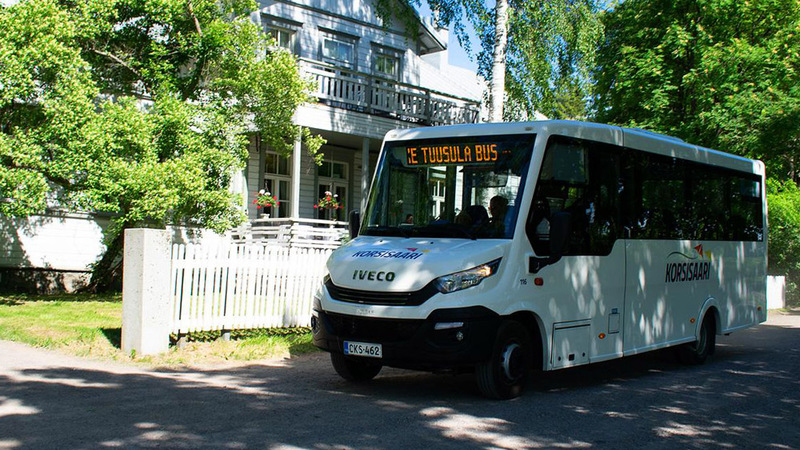 Once again we availed of the convenient Hop-On bus, and made our way to the Sarvikallio recreational area, once popular with the artistic community that lived on the other shore. Here we found the lookout point, 25m above lake level, with the views every bit as wonderful as we’d been promised, where we took the kind of photos that would ensure the envy of our friends! Soon after we caught another bus which dropped us off at Vanhankylä Manor, a stylish manor built in 1850 which has been recently refurbished to its original appearance. Vanhakylä has a a fine camping site attached, and also provides a range of services in its café, restaurant, and lakeside saunas. We decided to have coffee with a traditional korvapuusti bun, freshly baked and absolutely delicious, as we enjoyed yet another fine view over the bay. Shortly after our snack we were back on board the bus and making our way to Järvenpää again. 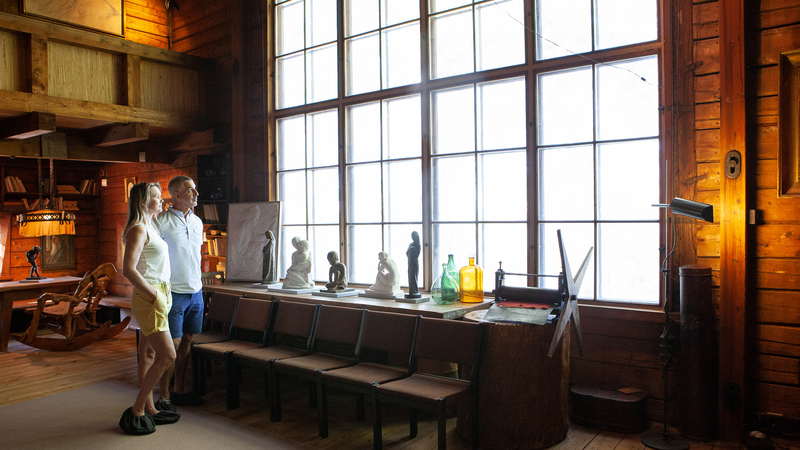 As we had some time before our train back to Helsinki, we decided to visit Järvenpää Art Museum, which has a permanent collection dedicated mainly to the works of Venny Soldan-Brofeldt and Eero Järnefelt, the two artists who had made their homes on the shores of Lake Tuusula over 100 years ago. The museum also hosts regularly changing temporary exhibitions, and is located in the same building as the town’s library, next to the railway station. For tourists visiting Finland, there are few places with such a wonderful blend of cultural attractions, natural wonders, and extensive services. 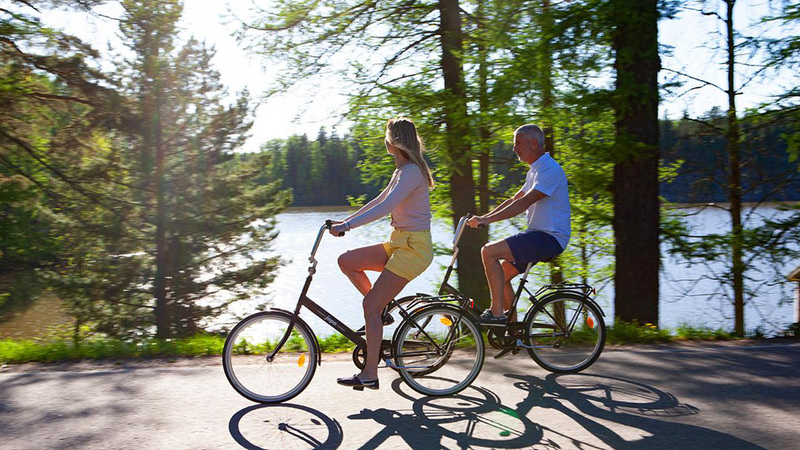 Lake Tuusula provides a wide range of accommodations, including summer cottages, private villas, modern hotels, as well as camping and caravan facilities. 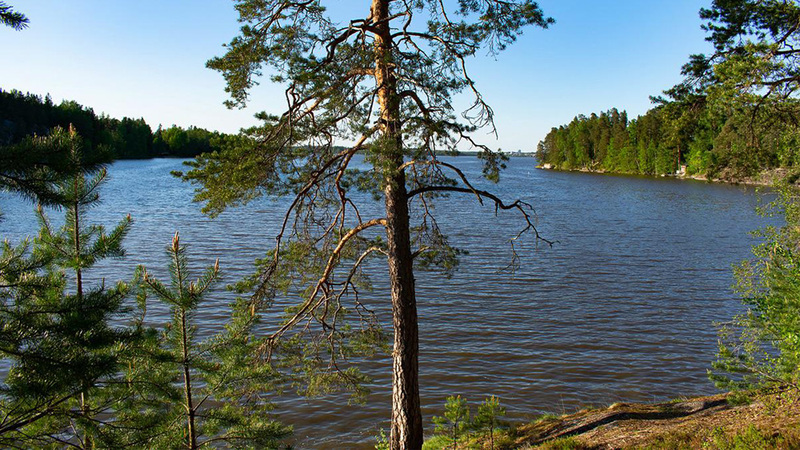 The trail that winds its way around this beautiful lake is a natural attraction in itself, but there are plenty of nature trails here too, and hikers will find more remote locations such as the Lemmenlaakso Nature Reserve with a little effort. Gamers will find plenty of excitement at Krapi’s Paja and Escape Room, as they will in the Exitcenter Escape Rooms. 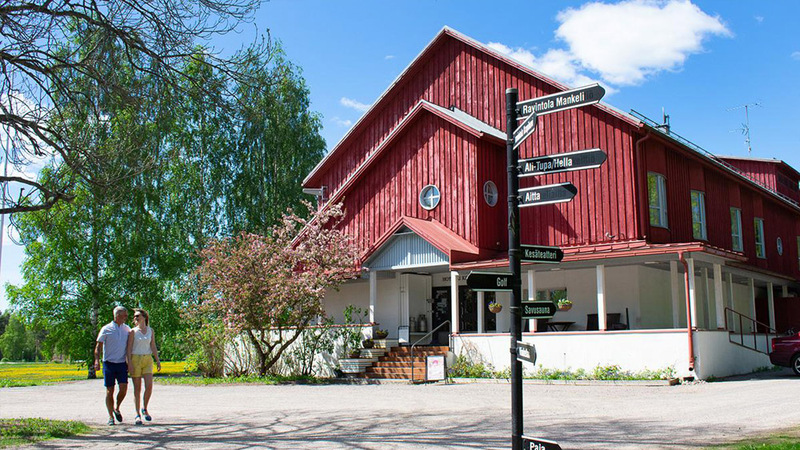 Entertainment in the region can be enjoyed in the Krapi summer theatre, as well as in Krapi Paja, with concerts and events also held throughout the year in Järvenpää Hall. There are plenty of accommodation options in the area, from the rustic chic of Krapi Hotel, the many choices of Onnela Inn, the modern Pescator Villas, or the charming seclusion of Villa Tammikko. 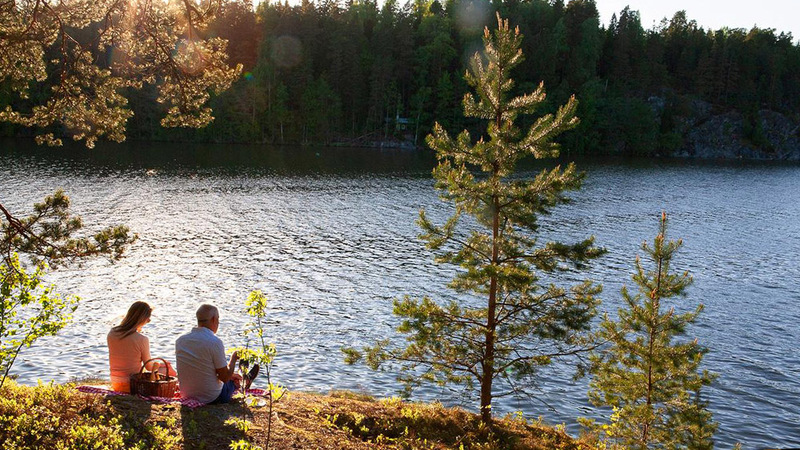 All of this is concentrated in a small area of great natural beauty, and all of it is just a 30 minute train ride from Helsinki centre – the easiest way to get there is to take a train to Järvenpää and continue with HopOn HopOff bus. So, when are YOU planning to visit? 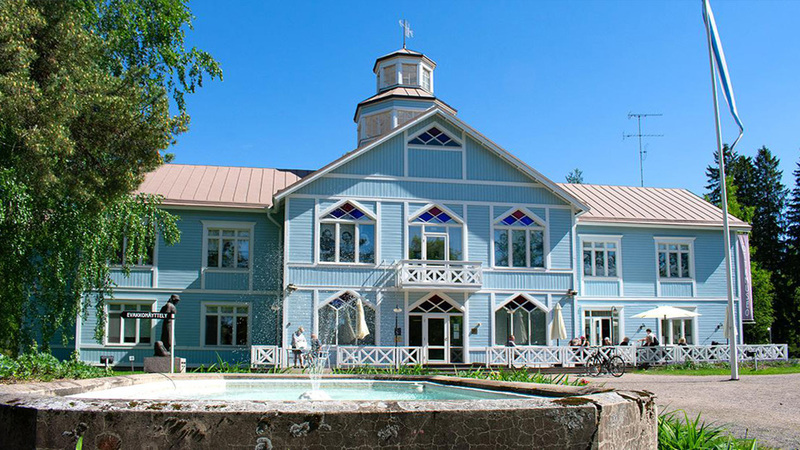 Pescator Villas – Luxurious Villas by Lake Tuusula.